We pride ourselves in using only the best coffee there is. We serve large size slices, to give you that special treat you deserve! Our AMAZING real ice cream milkshakes, in all flavours and sizes! 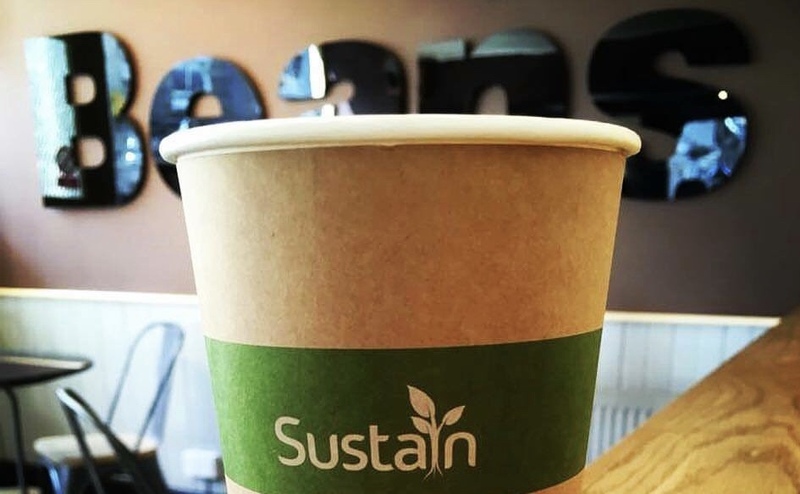 All our takeaway cups are completely compostable, including our lids! Beans Coffee Stop...beautiful location, beautiful atmosphere, beautiful coffee, what other reasons do you need to love coffee and cake! We may have retreated back to our spiritual home of Oundle in recent years, after opening shops in surrounding towns, but that’s not to say we’ve been busily dozing in the relative quiet of Oundle (although it’s such a lovely place anyone could be forgiven if they came here and simply relaxed). We’ve been making new flavours of tray bake cakes, including some delicious Vegan ones, and have introduced oat to compliment the choice of dairy, soya and almond for hot drinks. We’re also making tentative steps to possibly open another cafe, but this is very much work in progress and nothing definite yet. Watch this space! With all the publicity about the scourge of coffee takeaway cups, all Beans’ customers can take heart that their favourite coffee shop was ahead of the game with our move to completely compostable cups in 2017. And this includes our lids and straws! Whilst we don’t claim to be leading edge, we try our best for the environment and always have done so. The Beans Team. We’ve always been immensely proud of our hard working team, and none more so than right now. Under the capable stewardship of Amy Bollans, cafe manager, along with her assistant manager Jenna Newsome, the Beans team is a tight knit unit dedicated to making Beans the ‘go-to’ cafe in Oundle. With keen customer focus backed up by a well-established training plan, the staff work hard to maintain standards of both drinks and food – much of which is home-made by themselves! I go to Beans every morning for my morning latte, and most often in with the ladies later on for lunch. It's always such a friendly environment with very welcoming staff. I would recommend Beans to EVERYONE!